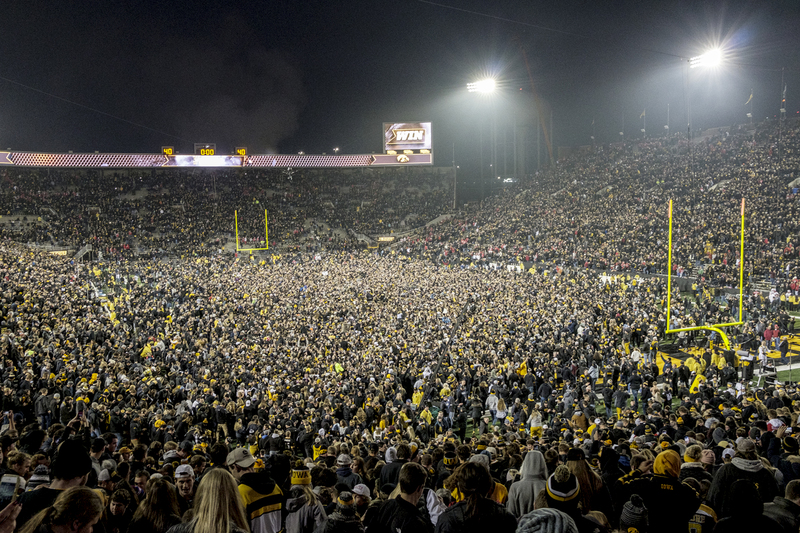 Fans storm the field on Nov. 4, 2017 after Iowa defeated Ohio State, 55-24. For the first time in history, Iowa football is hosting back-to-back night games. Kirk Ferentz and Company are no stranger to the magic that Kinnick Stadium holds during night games. With No. 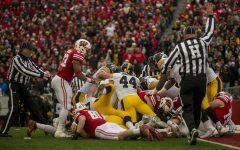 18 Wisconsin coming into town this weekend for a 7:35 p.m. kickoff, the 18th night game in the history of Kinnick could have major implications for a Big Ten title race. It’s worth taking a look at Kinnick’s Big Ten games under the lights, with an added bonus of a couple special games that each hold an exalted place in history. In the four nonconference night games that precede this list Iowa was 2-2, but the Hawkeyes have won six of their last seven night games, including last week’s victory against Northern Iowa. It’s probably not a great sign that this list is starting out with an Iowa loss. Despite that, they are few and far between for Kinnick night games. Iowa has never beaten a top-ranked team. Following the loss against Ohio State, it was 0-10-1 all-time, with that one tie giving NFL executives everywhere goose bumps (probably) for their love of the current pro overtime rules. Anyway, the Hawkeyes lose games two ways. They either beat themselves, or the other team is legitimately better. In this case, No. 19 Iowa beat itself. Three turnovers in the fourth quarter while facing only a 14-point deficit ruined any chance for a comeback. Iowa’s four turnovers in the game handed Ohio State 10 points. Not a great way to start off night conference games at Kinnick. Michigan has never had a good experience with night games at Kinnick, and this is where it began. Quarterback Ricki Stanzi (side note: who doesn’t miss him?) and tight end Tony Moeaki were the difference in the game. Moeaki had missed the previous three games with an ankle injury, but he definitely didn’t show it. He racked up 105 yards on 6 catches. In the fourth quarter, Stanzi found Moeaki for a 42-yard touchdown — the pair’s second of the night — giving Iowa the 2-point lead. An Iowa interception in the final seconds of the game sealed the Hawkeyes’ first night win against a conference opponent. With the win against Michigan, Iowa ran its record to 6-0 for the first time since 1985. Adrian Clayborn is scary; the NFL knows this. But before he was a defensive end for the Patriots, he was playing (Nittany) Lion-tamer for the Hawkeyes. “If Kinnick Stadium’s turf was still natural grass, opposing quarterback Rob Bolden’s jersey would have been littered with memories of Clayborn,” Scott Miller of The Daily Iowan said. Clayborn was the anchor of an Iowa defense that shut down No. 22 Penn State. He recorded 10 tackles (3 for a loss) and 1 sack for a loss of 15. The defense as a whole allowed only 54 yards rushing. On the offensive side, Adam Robinson was handed the ball again and again … And again. He recorded a career high 28 carries for only 95 yards, an average of just 3.4 yards per carry. The running game as a whole collected 122 yards. The defense was enough to beat the Nittany Lions. Iowa’s last touchdown came on a 33-yard Pick-6 for an insurmountable lead at 24-3. There are things about football games that people remember, and there are things that people don’t. For example, safety Tanner Miller will be remembered for the first-quarter touchdown against Northwestern that gave Iowa a 10-0 lead and momentum for the rest of the game. But without defensive end Broderick Binns holding the Wildcat quarterback’s ankles, and tackle Steve Bigach barreling toward him, the last-ditch attempt at a pass might not have ended the way it did. Northwestern tied the game in the third-quarter, but two rushing touchdowns, a pass for 6, and a field goal gave Iowa 24 points in the fourth quarter for the victory. “Iowa goes ‘thud’ in the night,” the DI sports headline read the following Monday. It’s not a secret that the Hawkeyes’ bread-and-butter is the running game. It’s what Iowa does, always, sometimes even on a third and 15. When Iowa’s running game is off, everything is off. And against Penn State, it didn’t even show up. The Hawkeyes recorded just 20 yards on 23 carries in the game. Twenty. Yards. Maybe this was because of tailback Mark Weisman still feeling a sprained ankle and was slowed down so much in the second quarter that he was practically ineffective. Iowa lost because there was no running game, and Penn State took the victory by more than making up for being showed up two seasons before. 2015 was big year for Hawkeye football, so it’d be irresponsible not to pay homage to the game that got the momentum started. Iowa’s success against Pittsburgh began with an adjustment to the passing game and ended with a kick. It’s as simple as that. Quarterback C.J. Beathard started throwing the ball down the middle of the field, and the offensive line started protecting him. With the score knotted at 24, Iowa had 52 seconds to make its way downfield. “And then there was the kick,” the DI’s recap page said. From 57 yards out, Marshall Koehn sent the ball through the uprights, and Iowa was on its way to history. “Nov. 14 cannot be replicated anywhere, ever,” Danny Payne of the DI wrote. It was the night game of all-night games. As the sun went down, Kinnick Stadium filled up with fans for its annual blackout. This time, the team joined in. With the lights on and the speakers blaring, AC/DC’s song “Back in Black” has never been so literal. The defense wasn’t great, but the offense was better, and it turns out, that’s all that matters. Iowa’s 17-point second quarter turned out to be the difference in the game, because the good guys in black were out-scored 21-16 in the second half. With a little more than five minutes left in the game, the Gophers came within 5 of the Hawkeyes. And then, LeShun Daniels Jr. took off into the night with the ball in hand. Fifty-one yards later, the game was sealed. Minnesota scored again, but it was too late. This is the second chapter — and the final to date — in Michigan’s struggle with Kinnick night games. It must be the lights. Five years after Iowa’s last Kinnick upset, Iowa fans held on to each other as kicker Keith Duncan lined up for the final play of the game. Michigan was undefeated coming into the game, and the mentality going in as a fan was that Iowa would be slaughtered. But Josey Jewell decided before that Saturday even came, that the defense could hold its own and come away with a win — if the offense could put up 14 points. 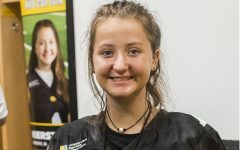 The score was 13-11 and all of Iowa City’s faith was in a true freshman. Looking back on the tape now, it is still heart-stopping how close that kick was. But at the time, in that moment, it didn’t matter. 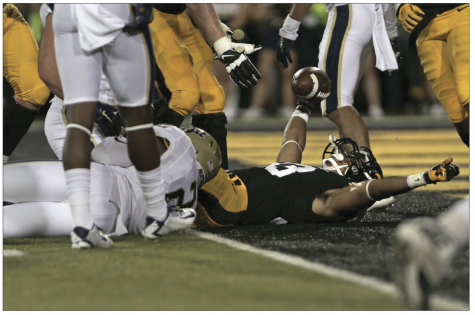 The offense had put up 14 points, and Jewell kept his promise. Hawkeye running back Jordan Canzeri (33) scores a touchdown against Pittsburgh on Sept. 19, 2015. While Michigan is very bad at Kinnick after dark, Penn State is pretty good. Penn State led Iowa in everything imaginable — yards, third-down conversions, first downs, time of possession — but Iowa was leading on the scoreboard with five seconds left. That next second, a fourth-and-goal from the 7-yard line, changed everything. Almost in slow motion, the pass went up the middle through two Iowa defenders’ outstretched hands, and into the arms of Penn State’s Juwan Jackson. After beating No. 3 Ohio State later in the season, Iowa fans can only wonder what might have been. Much like during every game in 2018, the defense held the Hawkeyes together against Minnesota in their last Big Ten night game. The offense got off to a hot start with an 80-yard first drive into the end zone, but then, it pretty much stopped there. That was the only score in the first half, with Iowa and Minnesota each tacking on 10 more in the second. But, as the DI said, nothing would beat the last time these two teams met at night. This one certainly didn’t. This is one of those circumstances where it would just be irresponsible not to include a specific game. The 2017 beatdown of Ohio State began at 2:30 p.m. but didn’t end until the sun went down. No one remembers showing up to the game in the middle of the afternoon, but everyone remembers where they were under the lights when the clock ran out on the Iowa victory, and that’s what matters. After the Badgers fell to BYU last week, Hawkeye fans’ hopes of another top-10 upset were ruined (but that’s a different story). Kinnick’s got some magic under those lights, and despite Wisconsin might not have as much bad luck as Michigan does, there’s no way it will play like Penn State. Badgers, good luck. You’ll need it.